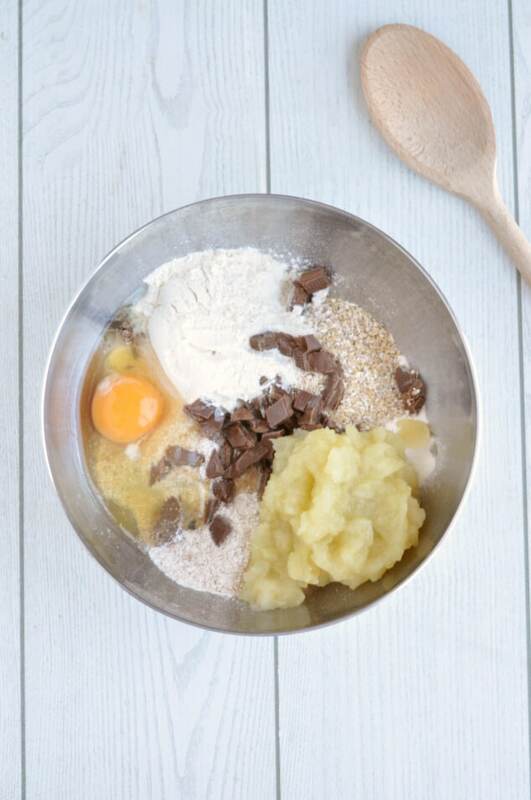 You are here: Home / Muffins / Healthy Oat Bran Muffins with Chocolate Chips – XXL Bakery Style! Monday morning. The time when we all decide this week will be the one. We’ll get all our work completed on time, we’ll tick off all those things on our to-do list we’ve been putting off, we’ll totally rock our workouts and we’ll stick to our healthy eating meal plan. But unless you’re a total productive rockstar (in which case I digitally applaud you!) by Tuesday afternoon we start slacking and then by Wednesday all those goals we set with the best of intentions have gone out the window. Sound familiar? It does to me because that’s pretty much how all my weeks pan out. But you know one thing that’s guaranteed to keep me on track, keep me crossing things off my to-do list and stepping-up my fitness outfits like I go to the gym and don’t just run around like a freak in my house? Healthy snacks. 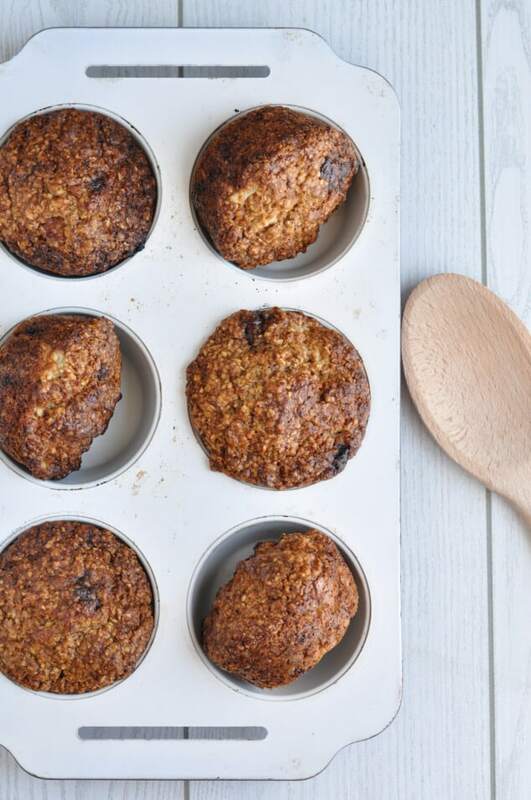 Which is exactly where these healthy oat bran muffins come in. When it comes to food, I’ve got very little self-control. I simply can’t go from breakfast to lunch or lunch to dinner without nibbling on a little something in between. So the best way I can combat this is to make sure I’ve got plenty of high fibre, low sugar, low fat treats around like these healthy bran muffins. How do I know I’m actually going to eat these healthy oat bran muffins and not just shove them aside in favour of a s’mores Pop Tart? Because they taste ah-maz-zing. Seriously – they taste as good as a regular fat-filled sugar-loaded heart-attack-in-your-hand bakery muffin. That’s right. A healthy oat bran muffin you’ll genuinely want to eat. I’ve achieved the impossible! A while ago my boyfriend brought home some oat bran and I didn’t even know what it was. It looked like a cross between flour and couscous. I looked it up online and found out that you use it to make healthy breads and muffins. But not the yummy kind of healthy breads and muffins. If you didn’t know, oat bran has a pretty bad rep for tasting horrible and making tough, hard, icky-tasting baked goods. I love a good challenge. So I decided to take this hated ingredient and make something delicious with it. And I’m thrilled to say it all worked out. 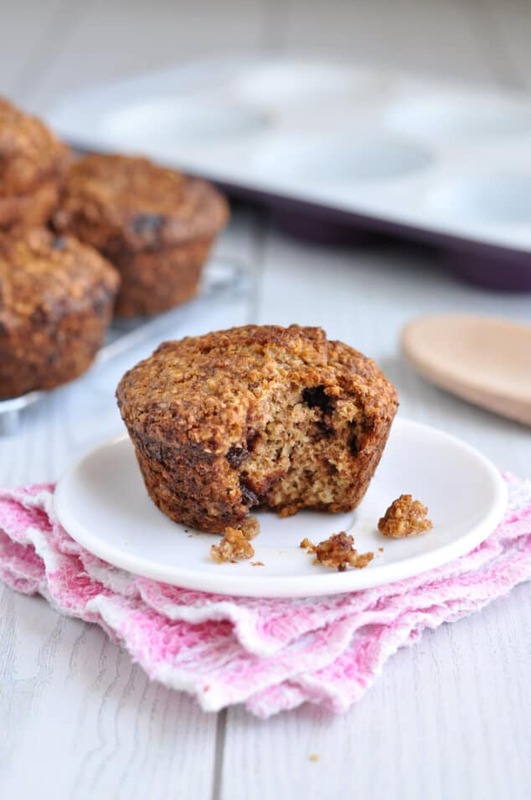 While these healthy oat bran muffins are a little denser than regular wheat muffins, they’ve got a wonderful chewy texture and thanks to all the fibre, they’re really filling. Filling enough to eat for breakfast. And that’s saying a lot coming from someone who can eat two bowls of oatmeal in the morning and still not feel full. You should see me at a breakfast buffet. I totally demolish it! Everything is better with chocolate, so I added some milk chocolate chips to the healthy oat bran muffins batter. When you bite into the muffin, little delicious pools of chocolate loveliness burst open and make you happy. And who doesn’t need an extra bit of happiness on a Monday? 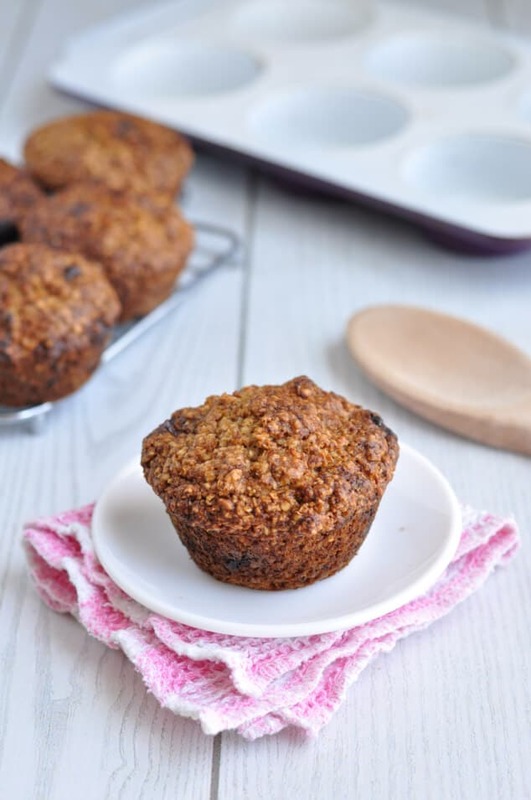 Healthy Oat Bran Muffins with Chocolate Chips - XXL Bakery Style! Think you don't like bran muffins? Think again! 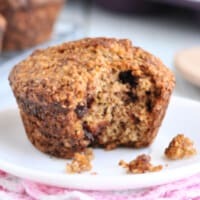 These healthy oat bran muffins with chocolate chips have got a wonderfully light texture, deliciously sweet flavour and plenty of chocolate chips to satisfy all your junk food cravings without any of the bad side effects. Preheat the oven to 400F/200C and grease or line a 6-mould muffin tin. In a large bowl, stir together all the ingredients until well combined and there are no dry pockets. Evenly scoop out the batter into the 6 muffin moulds and bake in the preheated oven for 15 minutes, until the tops of the muffins are golden brown. Leave to cool in the pan on a wire rack before storing or eating. These healthy oat bran muffins will keep well in a sealed container at room temperature or in the fridge for up to 5 days. You can freeze them in a sealed container or Ziploc bag and they'll keep for up to 6 months. If you don't want XXL size muffins, bake the batter in 8 muffin moulds. Then each muffin will work out around 125 calories. These look great, Nicky! I can’t wait to try them. I love a good, healthy muffin for breakfast or snack. Pinned! Those sound yummy, I could do with one of those every morning! Hi Nicky, I LOL when I read your post – I too have grand plans every Monday morning then panic come Friday because I have maybe done half of my to-do list. Anyway, these muffins are so great! What wonderful flavours and high in fibre, just too good. Pinning right away. I look forward to trying your recipe. I have been using oat bran and oat flour in more of my bread making lately – I like how it increases the fiber. Oat bran is so good for you. This looks and sounds super yummy! I’ve never thought about adding chocolate to a bran muffin. I am intrigued and pinning this recipe to try. Thanks for sharing! I love muffins and this one looks delicious. Thanks for linking up at Tell Me About It Tuesday. We hope you hop over and share with us again next week. They sound good! Do you think they would work with wheat bran? I’ve never used wheat bran before, so I really can’t say. Sorry! This looks like a pretty healthy and yummy muffin! I’ll have to give it a try. I tell ya, I’m not a huge fan of bran muffins but these sound quite yummy! Thanks for sharing your version with us and for linking up over at Tell it To Me Tuesday! We hope to see more from you next week! These look great! 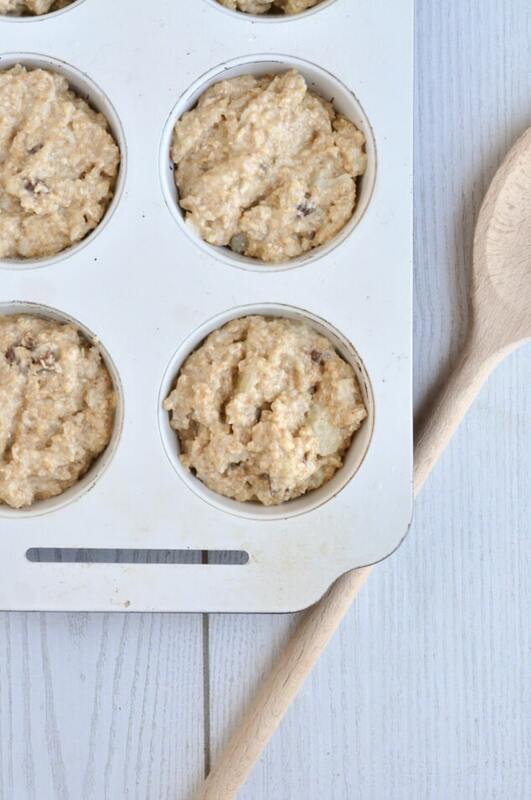 I love muffins for a quick breakfast for my kiddos in the morning and I think that we will all love these. I can’t wait to try them! Hi folks, I’m a regular oat bran user. I switched because I always found wheat bran to be too noticeable in my baked goods. I find oat bran to be nice and fine. I throw about half a cup of it into all my cakes and muffins and my picky picky son doesn’t even notice. I even throw it into cake. You’re right, Miriam. Oat bran is a lot easier to sneak into baked goods than wheat bran!